On August 31, wrapping up his three-day visit to the United States, Defence Minister Manohar Parrikar flew from Washington to Philadelphia to visit Boeing’s rotorcraft facility, where India’s Chinook helicopters will be built, starting next year. Business Standard visited the Philadelphia unit ahead of that visit. Parrikar was taken to a former locomotive manufacturing plant, which Boeing has transformed into a state-of-the-art Chinook production line. India’s billion-dollar contract for 15 Chinook CH-47F medium lift helicopters, signed on September 28, 2015, requires Boeing to deliver the first chopper in 36 months and the final one before 48 months — in 2018 and 2019, respectively. This will mark another shift in the Indian Air Force, which has traditionally used Soviet and Russian aircraft for medium and heavy airlift. Over the last five years, American C-130J Super Hercules and C-17 Globemaster III muscled into the fixed wing aircraft fleet. From 2018 onwards, Russian Mi-17 helicopters will be joined by that iconic American workhorse — the CH-47F Chinook. Simultaneously, the IAF will induct 22 Apache AH-64E attack helicopters, which Boeing builds in Arizona. Since 1962, when the Chinook first appeared on the Vietnam battlefield, its ungainly shape and tandem rotors have made it the world’s most recognisable combat helicopter. 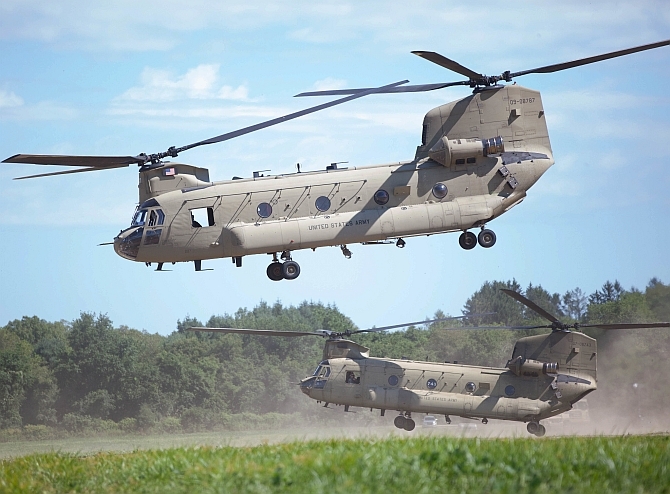 Fifty-four years and numerous versions later, the US Army has declared the Chinook will remain in service into the 2060s. By then, it would have been in active service for a century. Yet, the CH-47F version of the Chinook that India is buying is a high-tech marvel, a world removed from the CH-47A of the 1960s. 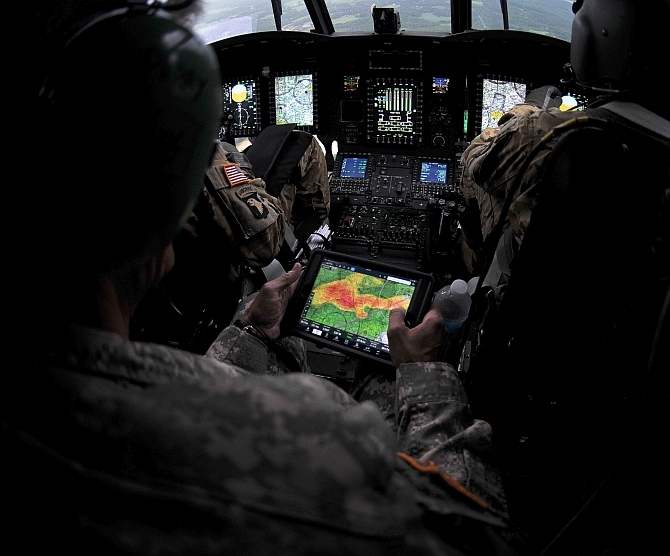 The CH-47F has an electronic brain called the Digital Flight Control System that precisely positions a hovering Chinook at the edge of a cliff, or above the roof of a mud hut, enabling soldiers or cargo to be discharged with unmatched precision. 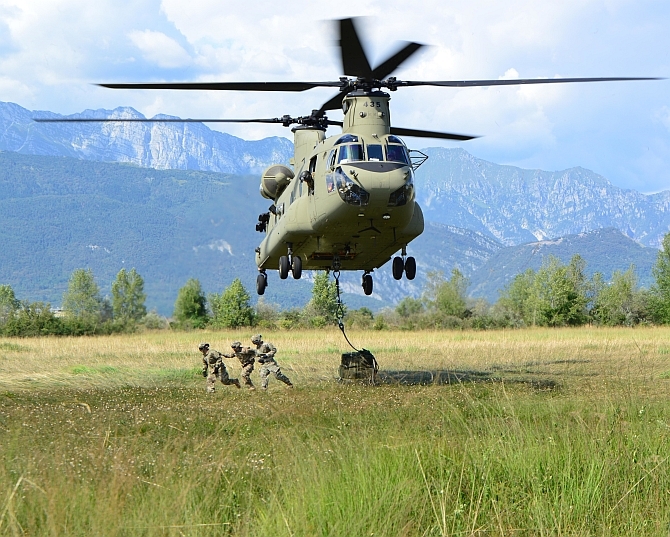 What most impressed Indian test pilots, say the Chinook veterans working for Boeing, was its ability to carry 10 tons of cargo, or up to 50 troops. In a conventional helicopter, 10 per cent of the power is wasted in driving the tail rotor, which prevents the helicopter from spinning. The Chinook is stabilised by two contra-rotating main rotors, so all the engine power translates into lift. IAF pilots tell Business Standard that the Chinook’s best feature, given India’s high Himalayan border, is its superb high-altitude performance. Boeing pilots in Philadelphia recount flying a Chinook over the top of Mount McKinley in Alaska — America’s highest mountain at 20,300 feet. 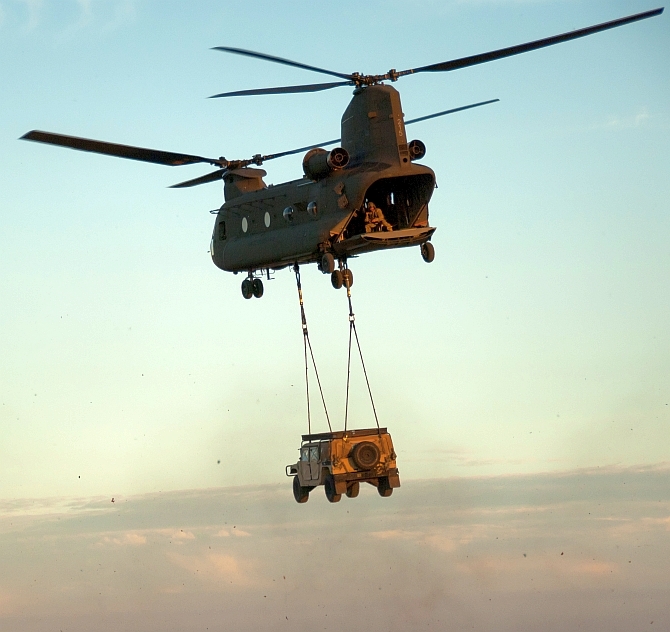 Its power allows the Chinook to air-transport a 155-millimetre howitzer, hanging from a sling under the helicopter. This lets tactical commanders move artillery guns to inaccessible areas, providing crucial fire support to troops in extreme altitudes. Another thoughtful Chinook feature is the positioning of its rear rotors, 18 feet above the ground. That allows large trucks to drive up to the helicopter’s rear ramp, and load or unload, while the rotor is spinning. India’s billion dollar order has generated about $300 million in offset liabilities for Boeing. To discharge these, Boeing is sourcing parts from three Indian private manufacturers. Dynamatic Technologies builds ramps and pylons for every Chinook being built today; Rossell Techsys fabricates wire harnesses and Tata Advanced Systems supplies crowns and tailcones.